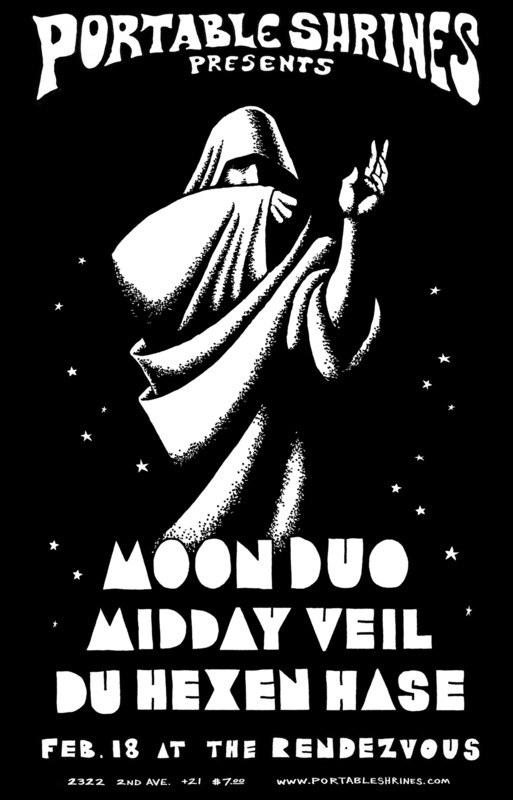 For the uninitiated, Moon Duo is the SF-based trance/kraut duo of Sanae Yamada and Ripley Johnson (of Wooden Shjips*). They are touring in support of a new full-length on Woodsist, adding to a quickly growing discography that also includes a 12″ EP from Sacred Bones and an out-of-print debut from Sick Thirst. Download their track “Stumbling 22nd St.” from Arthur Magazine’s blog now and psych yourself up for Thursday. *Last fall, I interviewed Ripley about Wooden Shjips for the Portable Shrines blog. Dig. ~ by emilypothast on February 15, 2010.